Jade is a turquoise coloured wolf with a white face, belly and white under her tail. She has large, glittery purple button eyes with black embroidered eyelashes and a black button nose with an embroidered mouth. The inside of her ears are also white. Jade was released in October 2017. She doesn’t have a Birthday or a poem. She is a Great Wolf Lodge exclusive and was released along with two other exclusives, Iris and Sierra. This is the small 6″ Beanie Boo version of Jade. 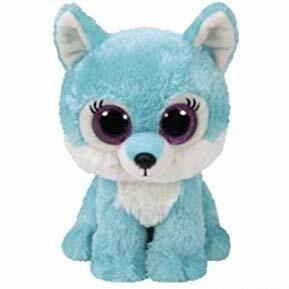 She was also released as a medium 9″ Beanie Boo Buddy.